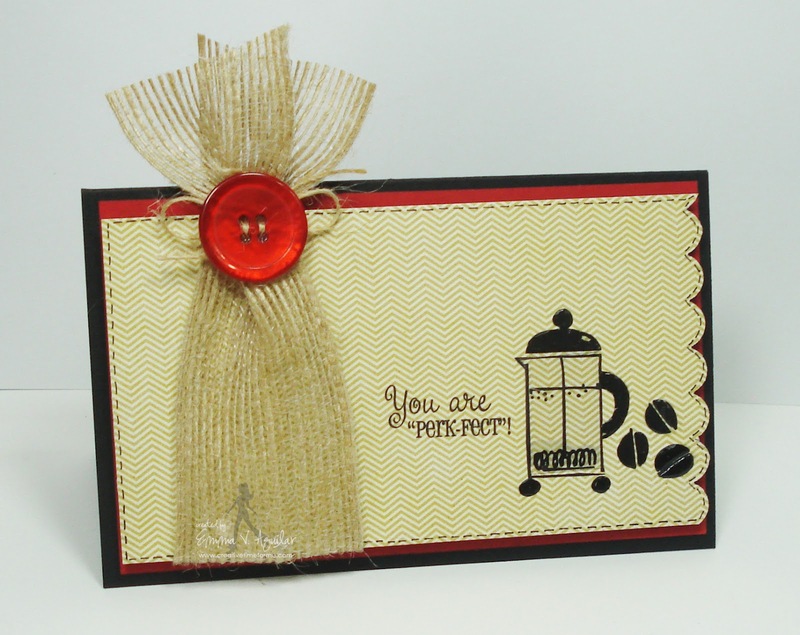 My Creative Time: MCT March Stamp Release "You are Perk-fect!" GOOD MORNING my Creative friends! Like I said before, I have a little for EVERYONE w/this release! 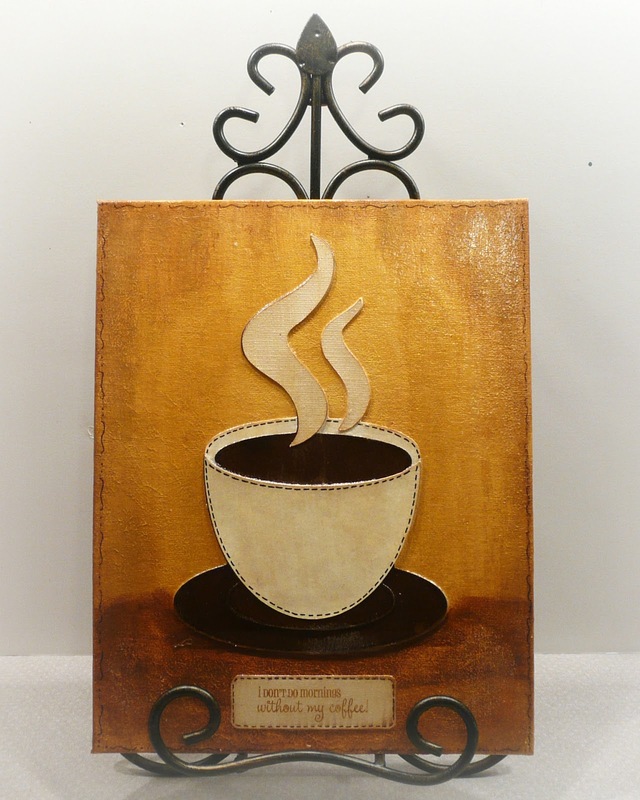 We covered my Tea drinkers, my Hot Chocolate/Cocoa drinkers .....and NOW, we are finally on our "Coffee Drinkers'! 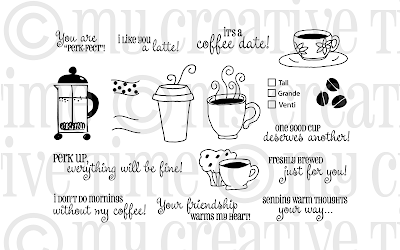 ;) I bet you after you all finish looking at my AWESOME design team projects, you are just going to want to RUN to Starbucks!!! hehehehe! ;) Okay, onto my card! Aren't all the images you have see SO FAR been GREAT? I think they are ALL just "Perk-fect"! 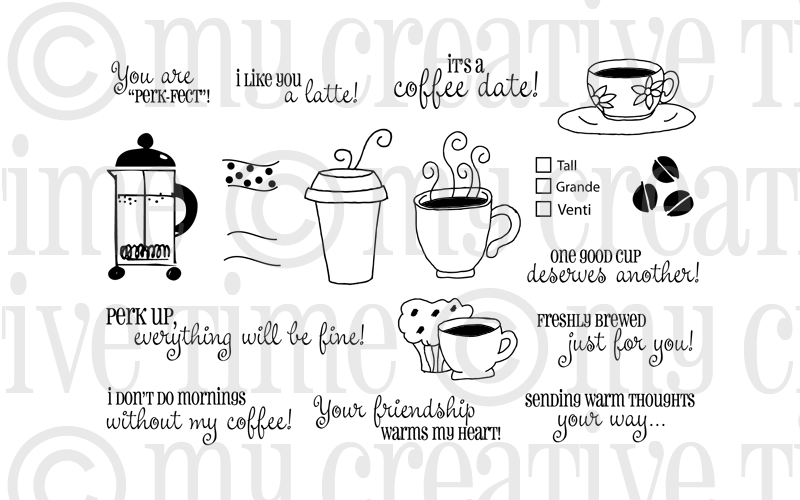 ;) Today, we are showcasing "You are Perk-fect" & some of my team are also showcasing "Coffee Backgrounds"! 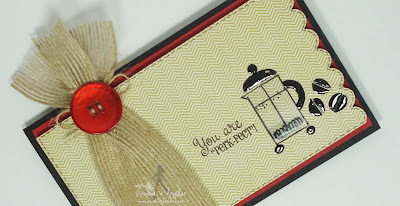 I used the Coffee Press image along w/the coffee beans & cute sentiment! Pattern paper was from Echo Park's "Charming" 6x6 paper pad & I thought the burlap ribbon w/twine & button just topped it off! I also added a little piece of clear acetate to the coffee press since mine is made out of glass! You can see it way better in my video below! Here are the 2 sets we are showcasing today! You all know that I LOVE to do giveaways for my new releases!!! P.S. I wanted to let you know that "My Creative Time's" very own Miss Glora is at Everyday Cricut this week! Let me tell you that you might want to head on over there because everything Miss Glora has created so far is just AMAZING! You can visit her HERE! Congrats on another awesome release!! Oh how I love this months release!!! I swear you are going to take me broke Miss Emma!! lol I love your card, these two sets are just awesome. I can't wait until I can ordered them as I just love them so much!! BEAUTIFUL job with your card and your new release Emma!This set is my favorite,I LOVE my coffee!Have a great day! :)PS your DT did a FANTASTIC job as always! 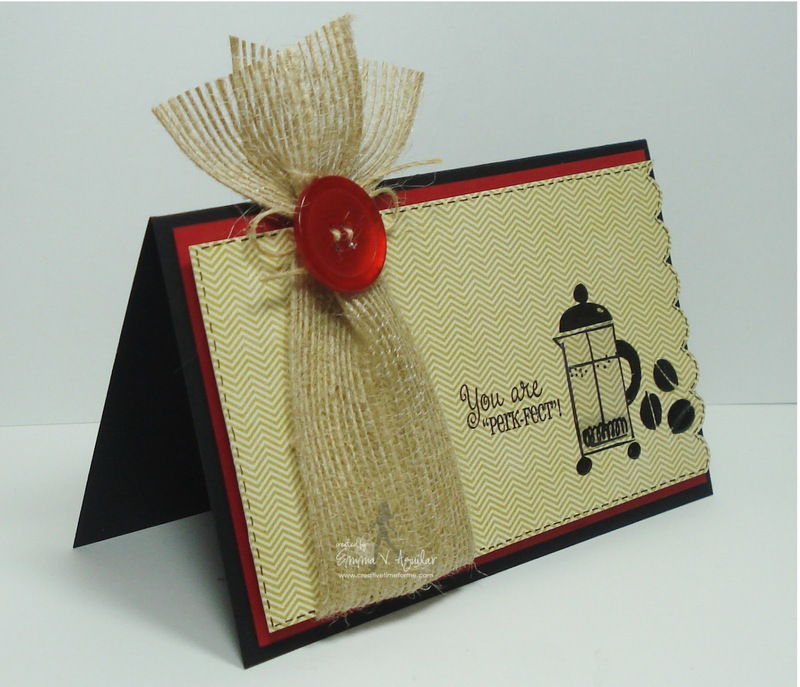 Beautiful card I love the ribbon and button!! Great job to the DT!! Can't wait for tomorrow's projects!! WOW!!! Each day of previews are better than the next! I love these stamps and your DT is just rocking them!!! LOVE your card Emma!!! 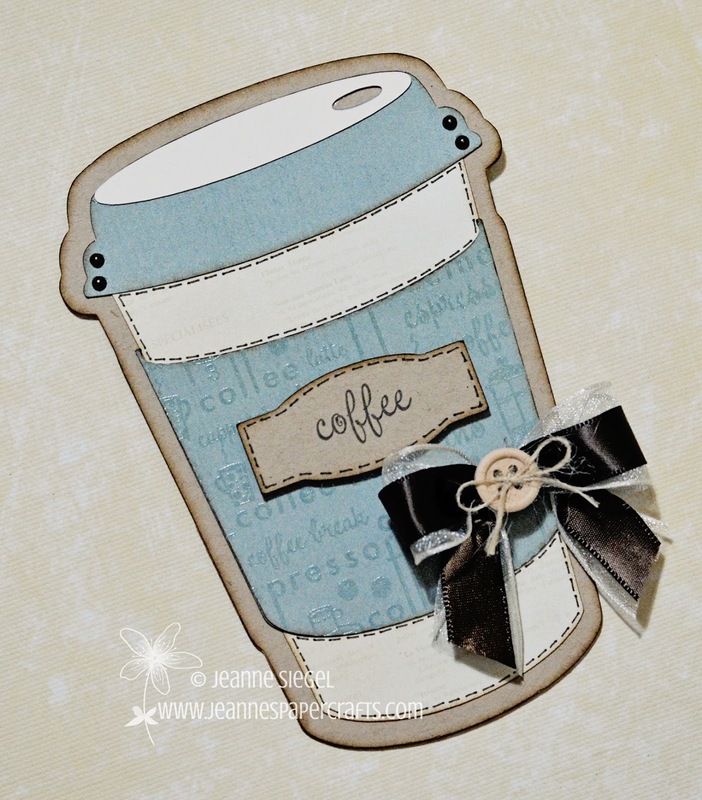 The texture is fab with that ribbon!! Congrats on an awesome new release!! 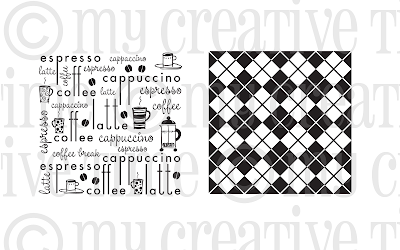 Love everybody's coffee cards! Emma, what a great idea to use the clear cardstock and Glossy Accents - it looks so real! Emma ~ Yet another BEAUTIFUL card! 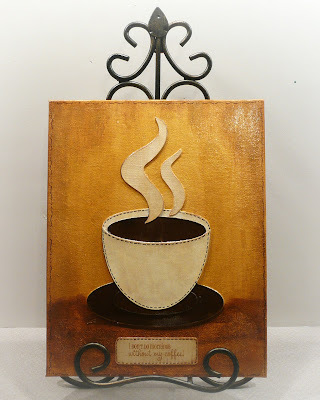 CLEVER to use burlap ~ coffee beans come in those sacks! This release, again, has endless possibilities! GREAT job! So LOVING it! This would be a perfect enhancement for my kitchen decor! Adorable projects!!! love this set!!! Too cute. I love the old style coffee press. Great job w/ this release. WOW Emma! These cards are just awesome! Thanks for sharing! I love all of the cards you made and the stamp sets are fabulous, a must have for sure! Wow, wow, wow!!! Everyone's projects just keep getting better. Love these sets so much!! Another great day of inspiration-Love the new stamps! such cute projects. great release. tfs. Love these stamps great projects from your design team! You and your DT really know how to showcase your new stamps! Wonderful projects! Emma this stamp set is so adorable! And your card is so cute! Love this release! You are so super talented! Have a great day! More great cards from an awesome set! Your designers are sooooooo good! Great coffee sets and very creative projects today! Emma I really love the Perk Fect stamp set! I would love to win it that would make my month! Emma your card is AWESOME! I love all the gloss and shine on it! SO PRETTY! And the DT did a beautiful job too! These stamps are just too fun! WOW! You are just so creative! I love all the new stamp sets! Great card also! Thanks for the giveaway! Another day of Perk-fect peeks...everyone did wonderful jobs on their projects. Emma...sorry your card video went to Paused Heaven but your stamping instructions were Perk-fecto! Your card is AWESOME! All the DT's projects are great too! They did it again. The design team showcased this stamp set off to Perk-fection. I love coffee and I love this set. Emma thanks for sharing how the sleeve details works on the coffee cup. Is it Friday yet? I can't wait. Very cute card! Sorry the video didn’t work out but thanks for the tutorial on how to use the slaves. I would probably be one of those people asking how dose this works. Thanks for sharing AJ! Wow!!! Great job everyone!! LOVE coffee!! So this is my Favorite set!! Hi Emma, I love you card and all the ideas I've seen so far are great, thanks for this new release I love it. I have to say this is absolutely my favorite set and I can't wait to get it! TFS Such awesome work. The DT was fantastic!!! I always wondered what that coffee thing was-you are just giving me all sorts of tips this week Emma! I never even thought to use scotch tape, here I've been wasting post it notes all this time! I soo love this set, you & your DT did a fabulous job on their creations!!! Another fabulous day of projects from you and the DT. I especially love Leanne's canvas project. My top pick for today. Such awesome projects, you do have the world's best design team, they are so talented and creative. I just love this new release and all of the fabulous projects! The canvas is awesome! Wow, these are all amazing and these set are the cutest! LOVE that coffee background set! Love all of the cards. Great inspiration. Great card Emma!! I love that little coffee press stamp (learned something new today!!) and your burlap bow is the perfect touch! All of these cards are so cute. Emma, I just recently found your blog and products and I am impressed! Lovely samples! Great stamp set Emma! Love your stamps! Wow, you DT did an awesome job on their projects!!! 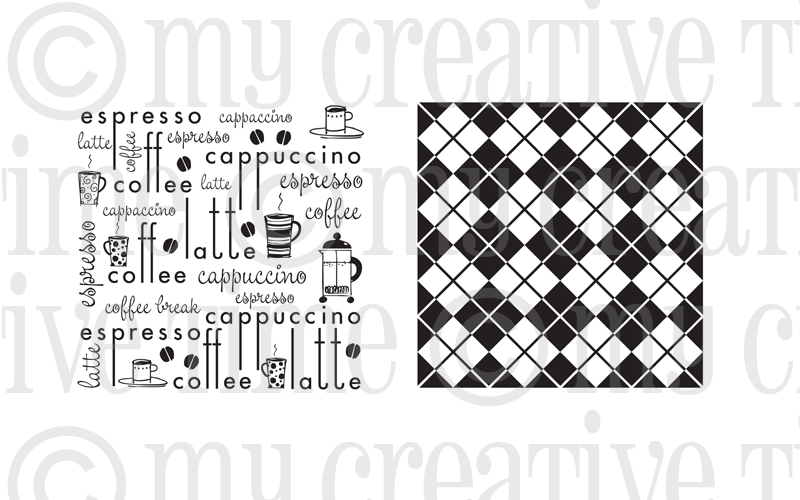 Ohhhhhhhhhhhhhh more caoffe stuff! LOVE IT!!!! (shouting and doing the coffe dance). Gotta' get some of these. The projects are super adorable and cute. I love the simplicity of them. I wouldn;t of thought a card that mainly has the brown hues and tones would look so very cool (or hot in this case of coffee). Did I mentioned I LOVE IT!? Be blessed everyone today and keep God close to your heart and his Word written on you heart. Your card is PERK-FECT! LOVE LOVE the ribbon! This is such an incredible release... love it all! I am always blown away by how creatively you use your stamps with your projects. Very cute card! Love the layout. As always, love your work Emma. All the peojects are terific!! !